Inland View in Trearddur Bay, near Holyhead, Anglesey sleeps 6 people. 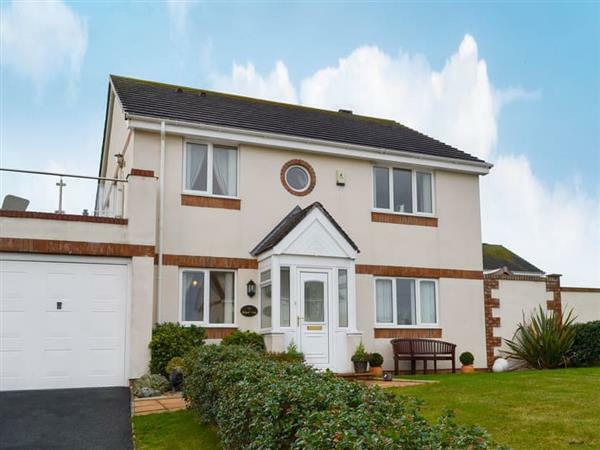 Inland View near Holyhead is superbly located within easy walking distance of a beautiful award-winning sandy beach; this spacious, detached holiday property provides well-appointed accommodation and a generous Welsh hamper. It enjoys panoramic views towards the mountains of Snowdonia from its unique and very spacious first floor balcony. Set at the end of a peaceful cul-de-sac, Inland View sits within its own well-kept enclosed garden. Shops, pubs and restaurants are within a short walk, with the setting of Trearddur Bay on Anglesey’s west coast, a perfect location for an exhilarating walk on the dramatic coastal path. Bird watching is also available or visit the famous South Stack Lighthouse. For day trips to Ireland, the bustling port of Holyhead is just 2 miles away. Golf, fishing and sailing is available locally, or the Snowdonia National Park is within easy reach. The beach is ½ mile from Inland View near Holyhead. With the shop, pub and restaurant ½ mile from Inland View. Living/dining room: With gas fire, Smart TV and DVD player. Kitchen: With breakfast area, range with electric oven and gas hob, microwave, fridge/freezer, dishwasher and washing machine. Bedroom 3: With single bed and door leading to balcony. Gas central heating, gas, electricity, bed linen, towels and Wi-Fi included. Welcome pack. Enclosed lawned terraced garden with patio and garden furniture. Private parking for 4 cars. No smoking. Please note: No children under 10 years old. Holidays at Inland View run from Friday to Friday. For a better idea of where Inland View is, you can see Inland View on the map below. Inland View is in Gwynedd; should you be on the lookout for a special offer, you can find all the special offers in Gwynedd. It's always worth checking to see what is on offer at the moment. Do you want to holiday near Inland View (UK10396), you can see other cottages within 25 miles of Inland View; have a look to find your perfect holiday location.